Bermuda to Santa Maria to Casablanca - - PAGE 3. Bermuda to Santa Maria in the Azores Islands · · PAGE 3. March 26, 1964: She departed Bermuda for an overnight flight arriving at Santa Maria on March 27. Jerrie mentioned how dark it was ahead as the sun set in the west behind her. It was a night with a full moon and a sky full of stars as there was no haze in the atmosphere above her cruising altitude or lights anywhere below. She could see the scattered clouds below reflecting the moon light with the blackness of the ocean beneath the layer of clouds. The image below is what she must have seen looking East above the clouds. I set the Google Earth view angle to show as many stars as possible and to limit it to showing the blacked out ocean horizon with the course line going to Santa Maria. 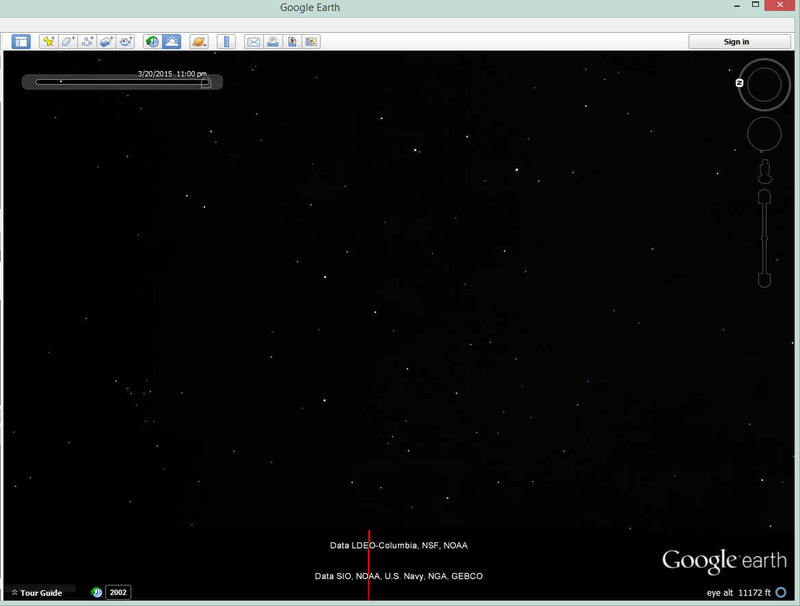 I set the Google Earth time for night time simulation. It made the ocean BLACK just as she described it in the chapter. The real-world clouds below her climbed higher as she flew East. When she entered the top of these clouds, she had a new experience: ICE on the airplane, and that was not good. She had picked up some ice at one point during the night. She climbed up from 9,000 feet to 11,000 feet to get above the clouds and stopped collecting more ice. The ice melted after sunrise since she was above the clouds in bright sunshine over the Atlantic Ocean. She would later see the clouds below were broken revealing some LAND below the clouds! She did not expect to see land if she was on course. The land was Pico Island in the Azores with a 7,400-foot high dormant volcano which was the first thing she noticed. She was about 90 miles north of her intended course from Bermuda. She had about 200 miles remaining to reach Santa Maria, but it could all be done using VOR and NDB radio beacons now, no more dead reckoning with the compass and the clock. The image below shows clear weather, but Jerrie saw mostly clouds below her when she flew past the island and volcano. The eye altitude for the graphic below is about as close as I could get to her 11,000 MSL cruising altitude. 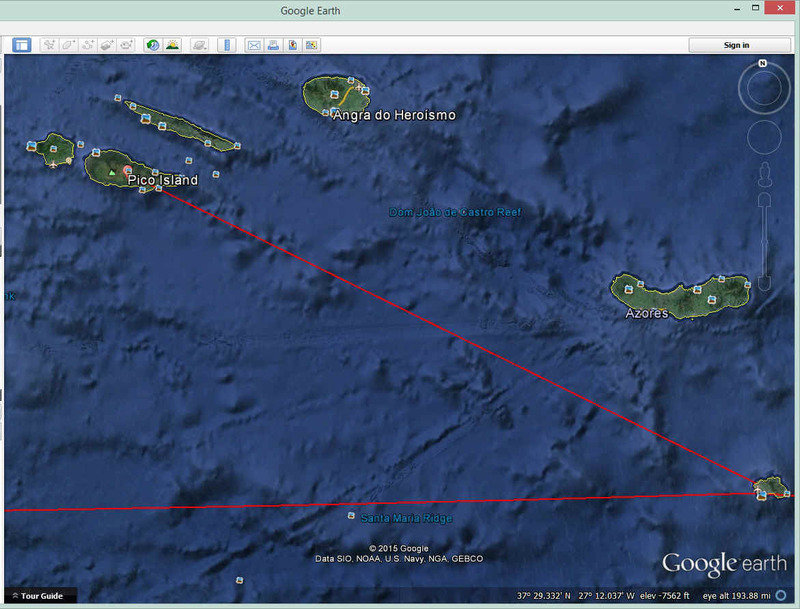 The red line on the right side is the intended course line from Bermuda to Santa Maria. Here is her final course from Pico Island to Santa Maria Island. The red line at the bottom of this graphic was her planned direct course from Bermuda. The clouds she saw enroute from Pico Island obscured most of the ocean and Santa Maria Island with the airport near the shore on the west side of the island. That runway below is 10,000 feet long. The RED course line from Bermuda continues EAST toward Casablanca. 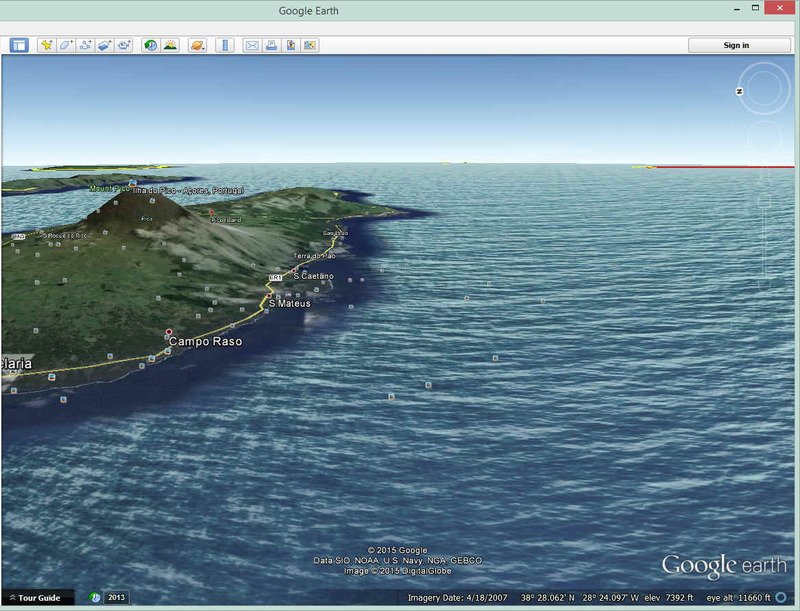 All Google Earth images are chosen to be as free of clouds a possible. That island seen below in the distance is actually 50 miles away with mountains that are 3000 feet high. The approach controller warned her of mountains on Santa Maria island that could be hidden in the clouds. She flew south of Santa Maria using the NDB to guide her as she descended below the broken cloud layer to about 400 feet over the ocean, then turned toward the airport when it came into view. The cloud ceiling was just 100 feet above the runway when she made her landing. It was certainly not clear as seen here using Google Earth. All she could see was the runway and the area near the terminal buildings. I have given the photo above the overcast cloud treatment. This is more likely what she saw on approach with a ceiling of only 100 feet above the runway. Then she touched down on the runway, she would have been able to see further down the runway under the cloud deck compared to the image I have modified here. 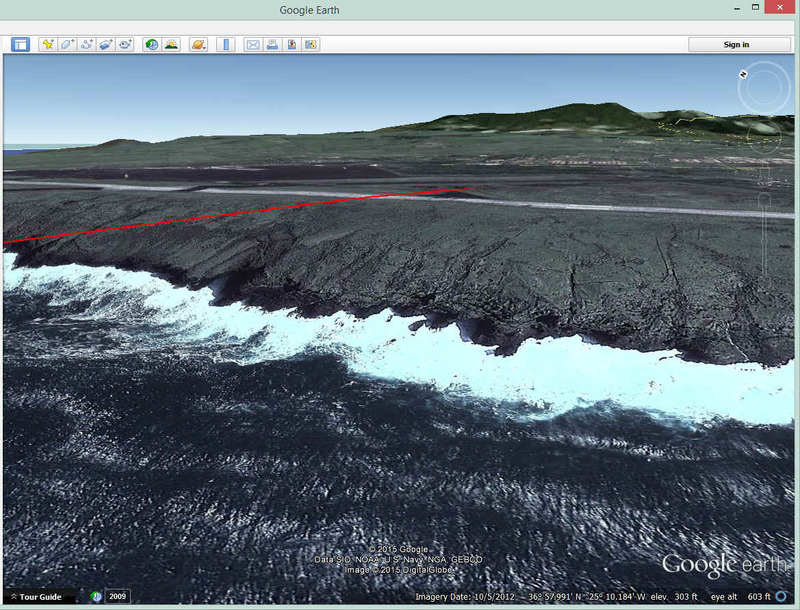 The airport runway is about 300 feet above the ocean as seen looking northeast in the Google Earth image below. The highest peaks on the island are just over 1,800 feet above sea level. The cloud cover that day concealed all the mountains on the island. The clouds were only 100 feet above the runway. It was the first instrument approach she made without an instructor aboard. 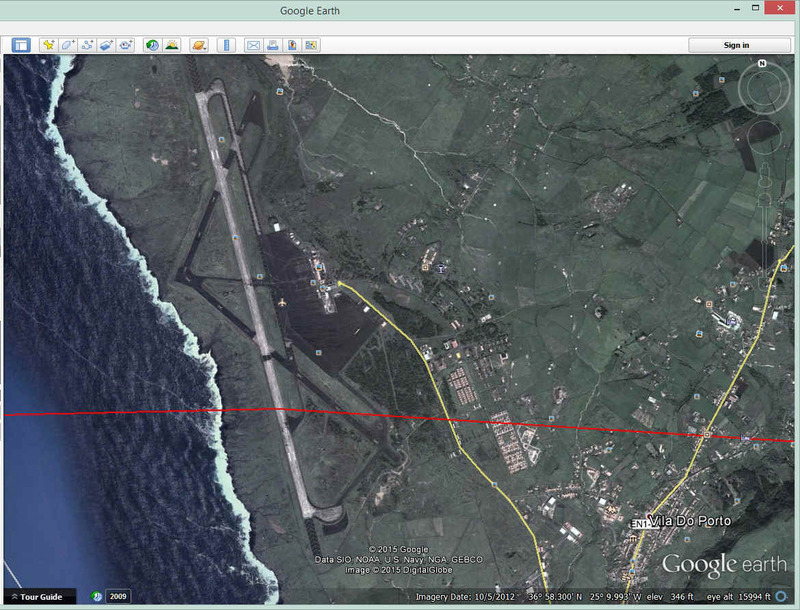 (The red line is the direct course line from Bermuda.) She was flying downwind parallel to the runway when she saw a hole in the clouds and could see the south end of the runway. She headed through the hole and made a visual approach to the runway for an easy landing. This is the first of seven pages of chapter five telling about her visit on Santa Maria. It tells of the people she met with the US Air Force when she arrived, and their help when it was time for her departure the next day. She did not use the runway for takeoff. You need to read the book for the details of how and why that happened. This photo was taken as she was getting out of the airplane upon her arrival at Santa Maria Airport. The extra mileage from being off course to Pico Island added 25 miles to her flight for a total of 2,281 miles from Bermuda instead of the direct distance of 2,256 miles. Jerrie had some time to get a short tour of the island later that afternoon even if she had been awake all night flying from Bermuda. June 4, 2015: I have been working on creating "GPS files" for the flights of Jerrie Mock. I have just completed the flight from Casablanca, Morocco to Bone, Algeria and learned plenty about the history of Google Earth images that make up the view of the planet available online to all of us. The next route I will be doing is for Bermuda to Santa Maria. With virtually all of it over the Atlantic Ocean, it is an easy file to create as all I have to do is create the takeoff and landing part of the flight and connect the dots along the route she flew. It will be interesting to see how well Google Earth animates the stars over the ocean at night and the sunrise as she neared her destination. March 28, 1964: The 1,024-mile flight from Santa Maria to Casablanca was the next day with no night flying required. 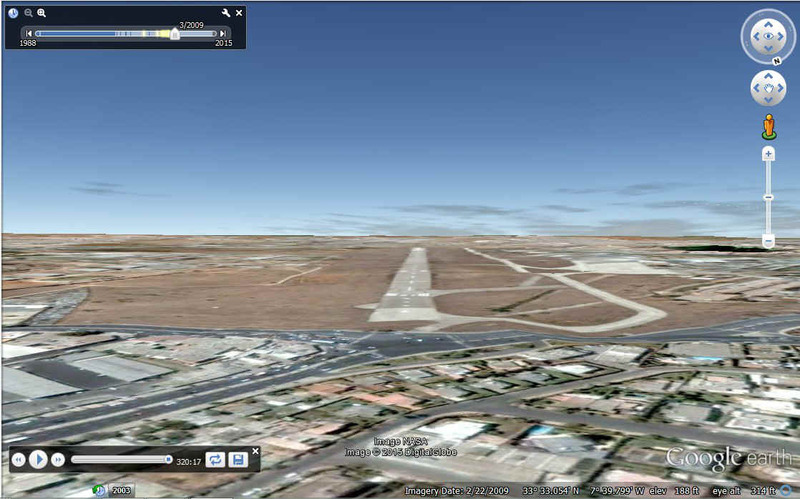 Here is a screen capture from my Google Earth Tour flight from Santa Maria to Casablanca. This tour requires older images from Google Earth. 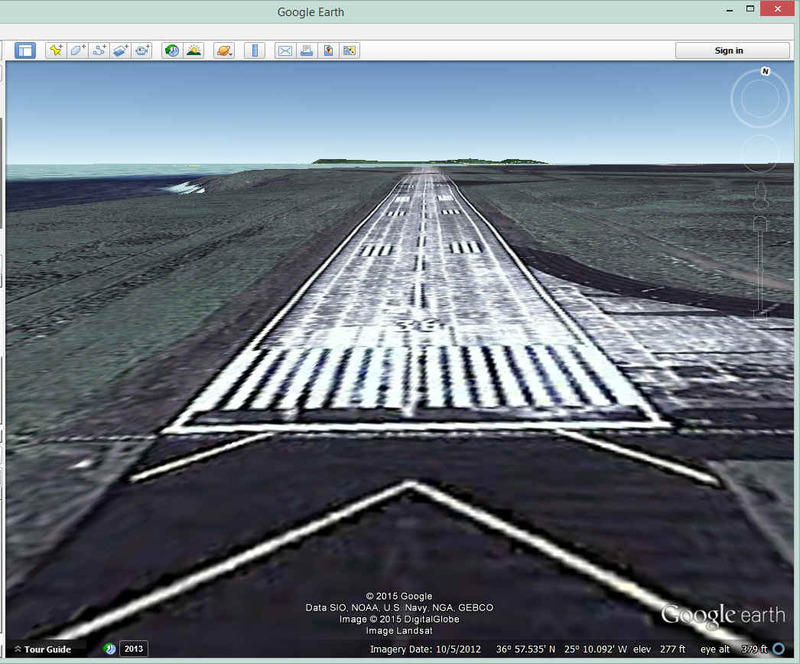 The date of this flight in the "GPS" file is March 25, 2009 to get Google Earth to show the old ANFA airport where Jerrie landed after her trip from Santa Maria on that date in 1964. 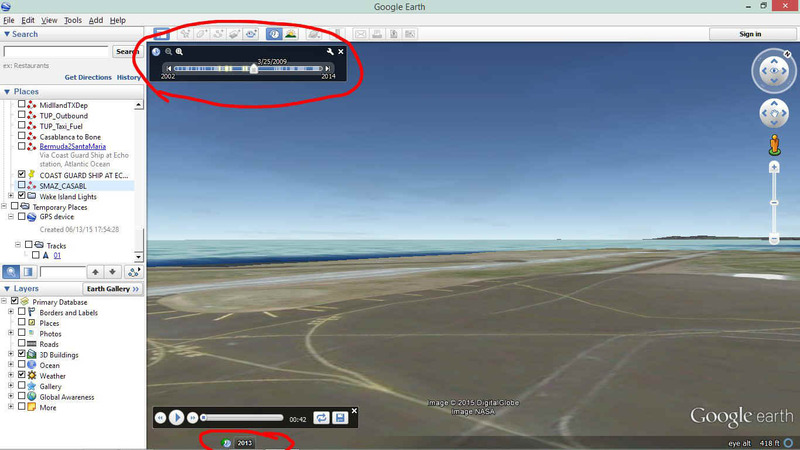 When the file is loaded into Google Earth, be sure the older image block is set like the one seen here. 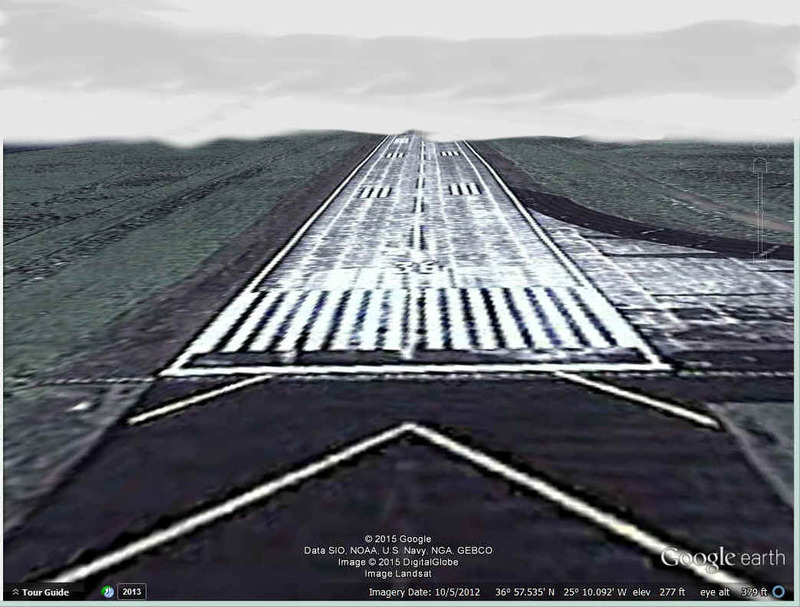 If you fly all the way to Casablanca and line up for a runway that is not there, click on the DATE BLOCK below the tour time slider seen below at the bottom of the Google Earth screen. The slider bar at the top will then show the date in the "GPS" file and the appropriate scenery is displayed. Here is a link to the Google Earth GPS file with flight segments from Ohio, Bermuda, Santa Maria, and Casablanca to Bone, Algeria. Her takeoff from Santa Maria did not use the runway. The wind was blowing hard from the west. The air force guys helped her get "Charlie" into position at the southeast corner of the huge ramp area and pointing directly into the wind from the northwest. She did not need much distance across the ramp to reach takeoff air speed and get away on the third leg of her journey around the world. You can see this image using the GPS tour in Google Earth. 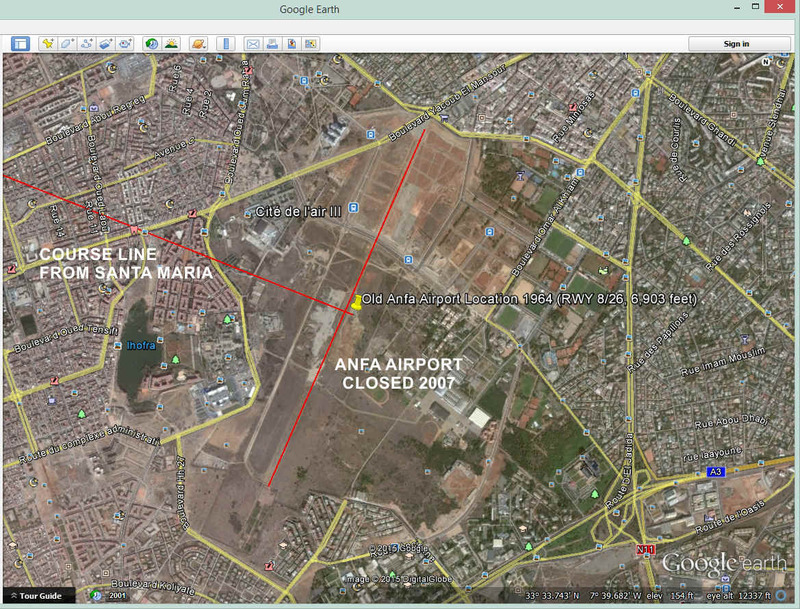 Here is the approach to the old Anfa Airport using 2009 scenery from Google Earth before the airport was finally destroyed in 2010. I used SkyVector to create a map of her flight from Columbus, Ohio across the Atlantic Ocean. SkyVector accurately plots the great circle route as you can see below. The white dots on the course line show Columbus, Ohio on the left, then Bermuda and Santa Maria in the Atlantic Ocean, with Casablanca at the right on the African Continent. All my SkyVector screen captures are 1440 x 900 pixels for best clarity. That is the same size as the display monitor I used to captured these images. Depending on your screen size and display settings, it may be necessary to use the scroll bar at the bottom of your web browser to see the entire map above and on the following pages. When comparing the SkyVector chart above with the same routes displayed using Google Earth, a straight line on the surface of the spherical surface of the Earth becomes a great circle route on a FLAT EARTH map. 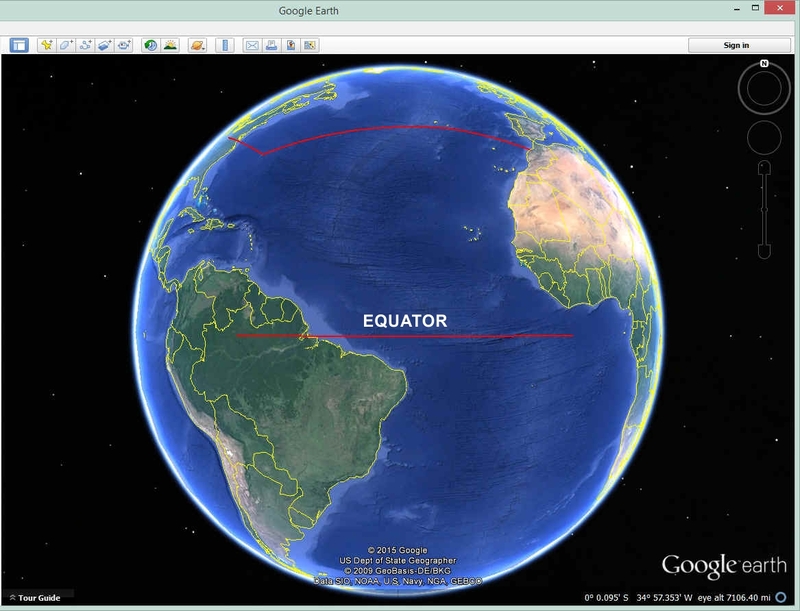 Completing our geography lesson requires a view of the Earth from directly above the Equator. Again, any route seen directly under the point of view in orbit appears as a straight line. 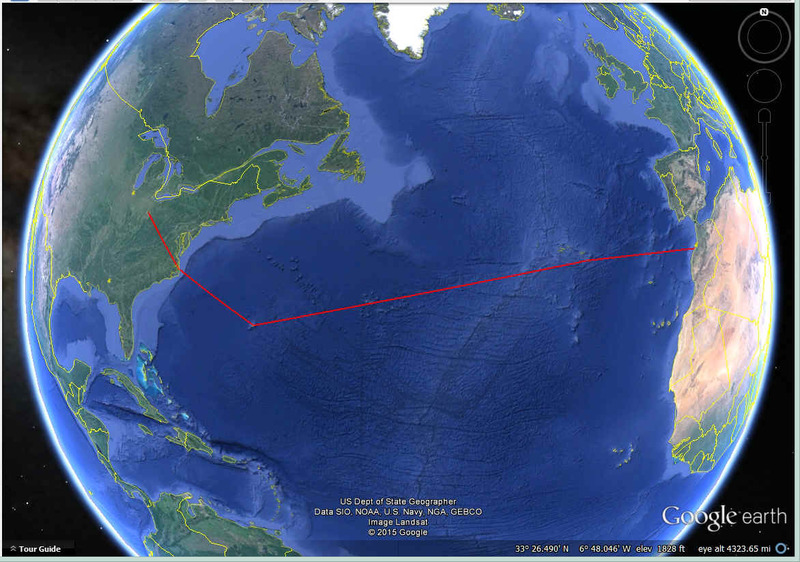 The route across the Atlantic flown by Jerrie Mock now appears as a great circle route. That "great circle" is our planet Earth or any other round celestial body.